Princess Diana: Princess Diana Death: Some Very Disturbing Coincidences! Princess Diana Death: Some Very Disturbing Coincidences! Princess Diana Crash: A Series Of Puzzling Coincidences! Why Was Tony Blair's Flight To Meet Princess Diana's Body From France Scheduled 2 Days Before She Died! Prime Minister Tony Blair was scheduled to be flown from his constituency in Sedgefield to London to meet the body of Princess Diana on its arrival from France in the aftermath of her death in August of 1997. What was rather puzzling was why the flight crew of the flight had been on standby to make that very same flight two days earlier on Friday...before Princess Diana had even died! A week prior to the crash in the Point d'Alma Tunnel the BBC (British Broadcasting Company) strangely conducted a dress rehearsal funeral for a member of the royal family. Who could it have been for? It is possible that it could have been for the Queen Mother, but at that time she was not ailing and in fact was in robust health for someone of her years and went on to live for another five years before her death in 2002. 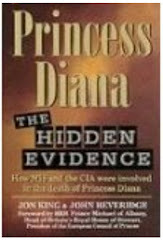 This intriguing "coincidence" was covered in Princess Diana: The Hidden Evidence an excellent book written by investigative reporters Jon King and John Beveridge! Why Was A Regular Wireless Operator At British Embassy In Paris Booted From His Post Minutes Before Princess Diana Left The Paris Ritz Hotel? The weekend of Princess Diana's death a spokesperson at the British embassy in Paris cliamed that staff there were unaware that the princess happened to be in Paris. YEAH RIGHT! Why then was a very senior Royal Courtier seen at the embassy half an hour before the crash! The senior courtier seen at the embassy a bare half hour before the crash (according to what appears to be a very credible witness) was none other than Sir Robert Fellowes (currently Lord Fellowes) private secretary to the Queen and brother-in-law to Princess Diana. Lord Fellowes is married to the late princess' sister, Lady Jane Fellowes. Lord Fellowes has been described as a man totally devoted to the monarchy and the Queen and in the graphic words of a senior British politician he is a man who well understands that the description of his duties entail him to "throw himself in front of the bullets before they hit the Monarch!" "he must know all that is going on; he must be ready to advise upon all. But he must never so advise that he seems to influence the decision taken by the Queen in terms of the premises of his own thought. He is the confidant of all ministers, but he must never leave the impression that he is anybody's man. He must intrude without ever seeming to intrude. He must learn how to deflect the lightning from others. He must be able to carry the burden of her mistakes. He must not know the meaning of fatigue. Receiving a thousand secrets, he must discriminate between what may emerge and what shall remain obscure ...It is a life passed amid circumstances in which the most trifling incident may lead to a major disaster." Coincidentally, the weekend that Princess Diana died, deputy Private Secretary Sir Robin Janvrin was on duty because his superior Sir Robert Fellowes had taken the weekend off. Subsequently in the investigation covering the death of Princess Diana Lord Fellowes was asked to account for his whereabouts that weekend. His response was that he was at his Norfolk estate in England with his wife and most certainly not in Paris! Apparently a few minutes to midnight, on August 30th, 1997, the regular wireless operator at the British Embassy in Paris was booted out of his office (the communications room which relayed and handled encrypted messages between the embassy and various sensitive locations within the UK). A few minutes to midnight, two well-spoken public school types (takes one to know one) burst into the communications room and ordered him to vacate the room and not return until otherwise informed to the contrary! Years later he angrily identified one of the men who kicked him out as follows: "It was that b*****d Fellowes. He turfed me out of my own office. He was in Paris the night Diana died!"